Firing on all cylinders from the penultimate draw, Nick Benterman from Bury St Edmunds, Suffolk seized the top-billed grand prix, and valuable world ranking points, with his consistent 11-year-old bay gelding Zorland D Volo. 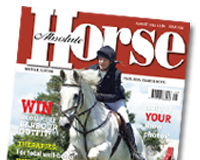 William Whitaker had led from the front with a fast, decisive round on Kington Langley Stud and Robert Livock’s 11 year-old grey gelding Mersley Chakotay, but conceded to second by a fraction to Nick’s late dash on Volo Sport Horses’ Zorland D Volo. “He’s so careful, I can ride forward and not have to stress about having a fence down, he’ll gallop flat-out to verticals and jump them,” said Nick, who wisely used tactics here. 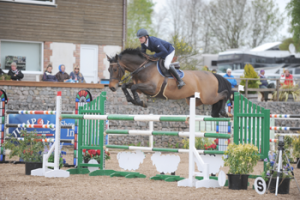 The pair, winners of the Chepstow 2* grand prix, had been knocking on the door for another win, taking third in the British Masters grand prix just four days earlier. “He’s a member of the family and my best friend, he has a great personality, a real people person,” said Nick, on the Corland/Indoctro gelding who has put him on the showjumping map. The win is a family affair. “We don’t have a groom and have decided to do it ourselves. My wife Katharina has been grooming him for the last month and you can tell the difference, she gives him confidence,” said Nick. It was a return to old hunting grounds here, as Nick first based himself at Keysoe when he returned from Norway with Katharina and their children. They are now settled in Suffolk. “I’d been away for 10 years building up the business, dealing and training students. That will continue, but I want to concentrate on the sport as well,” he said. Image: Nick Benterman & Zorland D Volo in action earlier on this year at Chepstow CSI**.